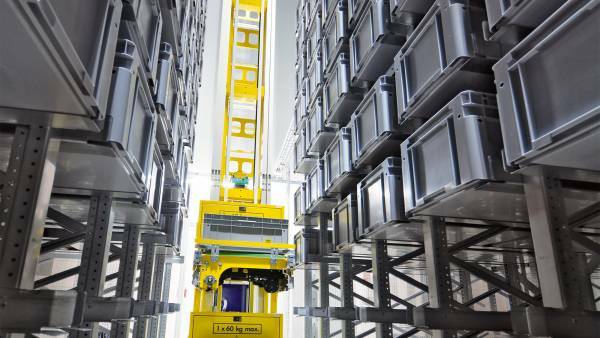 Storage library as hub for millions of books – Stöcklin Logistik AG. Förder- und Lagertechnik. Switzerland’s first collectively used hub for automated archiving and handling of library collections has now gone into operation in Swiss Büron. 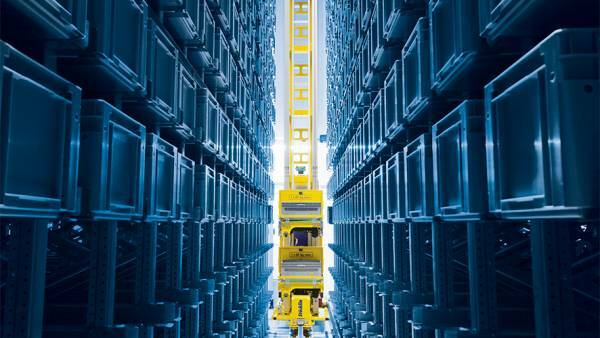 The “Cooperative Swiss Storage Library” has invested nearly 33 million Swiss Francs to provide space for approximately 3.1 million volumes. 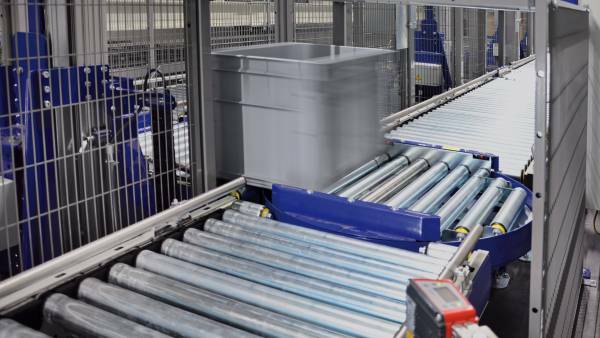 As intralogistics provider - from storage and retrieval-related equipment right up to storage management and control - Stöcklin Logistik AG contributed significantly to the implementation of this ambitious project. Relocation in progress. Since it was put into operation in February 2016, the Luzern Central and Collegiate Library, the Basel University, the Solothurn Central Library and the Zurich Central and University Library have moved a major portion of their books to the new storage library, idyllically located in Büron, Luzern near Expressway A2. This action to mitigate the increasing space problems at the institutes affects books, newspapers, magazines and other documents such as dissertations and brochures. 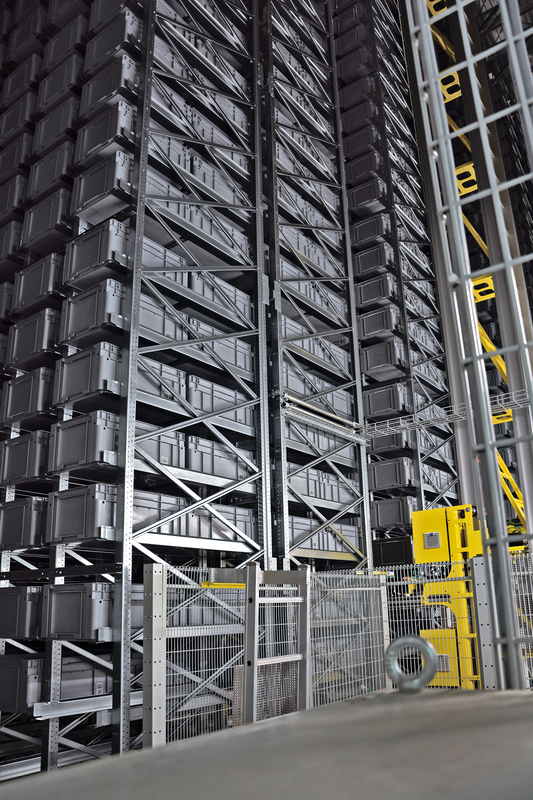 “The storage library with digitization facilities and automated container storage is the ideal location for storing less frequently used documents”, said Mike Märki, Business Manager of the “Cooperative Swiss Storage Library.” “It precisely fulfills our expectations for space-saving storage and efficient management.” Moreover the complex offers the highest standards in terms of preservation as well as technical security. 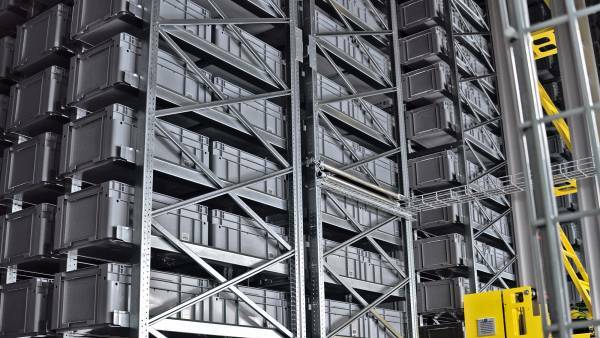 The heart of this earthquake-resistant storage building is a storage facility for small items, where fully automatic stacker cranes from the proven BOXer series provide dynamic control. This solution provided the basis for the Swiss system provider to receive the contract as intralogistics provider for realization of the country’s first hub for library books. The result was a show case project, completely satisfying all requirements. The oxygen concentration in the storage facility was reduced to help protect the valuable contents. This inertization prevents fires igniting, which could also damage, or in the worst case, completely destroy the knowledge collected here. Another requirement of the operating association was volume-optimized storage. This was intended to save space while ensuring cost-efficient operation. emphasized Mike Märki. The approx. 15 m high automatic small parts warehouse is 70 m long. It has six aisles each served by one BOXer E1 small parts unit. 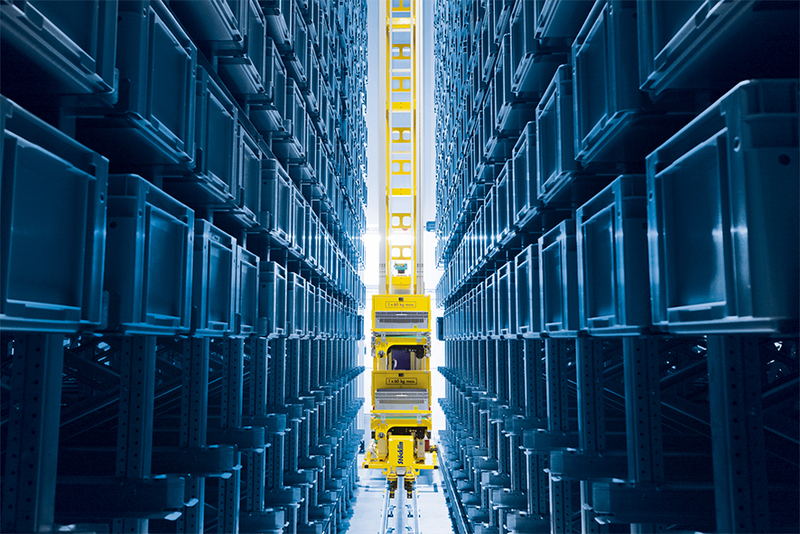 The stacker cranes are equipped with two load handling devices above one another and are capable of double depth telescopic storage in spite of the single depth aisles, allowing each unit to store up to 72 containers per hour. All totalled the free-standing shelves, which are uncoupled from the platform for earthquake resistance, can hold 112,200 containers with dimensions of 600 x 400 x 271/371 mm. The Aleph library program (Automated Library Expandable Program Hebrew University of Jerusalem) from the provider Ex Libris serves as host. It communicates with the warehouse management system (WMS), which manages the containers and storage locations, handles storage and retrieval orders and controls the entire material flow. Implemented strategies provide for constant route optimization, optimal management of the double-depth storage bays and reduced travel times for the stacker cranes, for example, by using double play routing. The Stöcklin WMS is also equipped with 2D visualization for monitor display of the operating states of the conveying equipment and small parts units as well as their allocation. This solution facilitates localization of any faults and accelerates trouble shooting. explained Ivan Jovanovic, responsible project manager for Stöcklin Logistik AG. The basic premise for laying out and implementing WMS was to keep interfaces and protocols between the applications used as simple and open as possible, to allow future conversions, for example, to successor ERP systems, to be accomplished with minimum expenditure. Material received is checked visually upon receipt, dusted in a special area on order and transported in a manual cart to the transfer locations for storage. Here Stöcklin installed a conveyor link on the second and third floors, each equipped with two workstations. These are connected via a loop with integrated NOK path. The workstations are equipped with “Put-to-Light” displays to increase the process reliability, allowing up to five orders can be picked simultaneously. During this process the shipping containers provided are placed on inclined roller conveyors, equipped with loose rollers to facilitate the operators’ work. The integrated profile and weight check prevents containers with protruding or impermissibly heavy loads from being stored. Such errors are displayed and the storage container is discharged for correction. said Ivan Jovanovic. This resulted in connecting the two floors with integrated picking areas to the conveying system at platform level using container elevators. The upper platform is coupled to the lower by elevator stations with a load capacity of 120 kg each. Each elevator station transport two containers above storage level, where they are fed to the appropriate aisle via a loop. 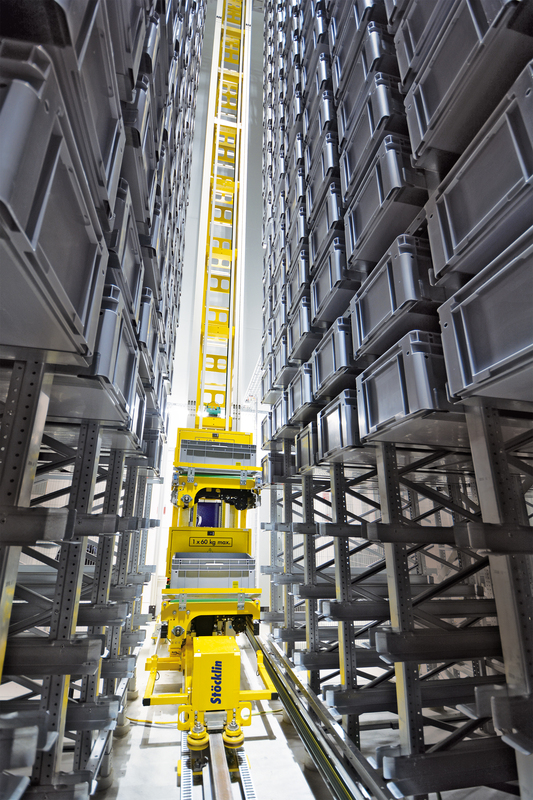 The aisles in the small parts warehouse are also connected via small elevator stations to overcome the difference in height between the conveying equipment loop and the storage. 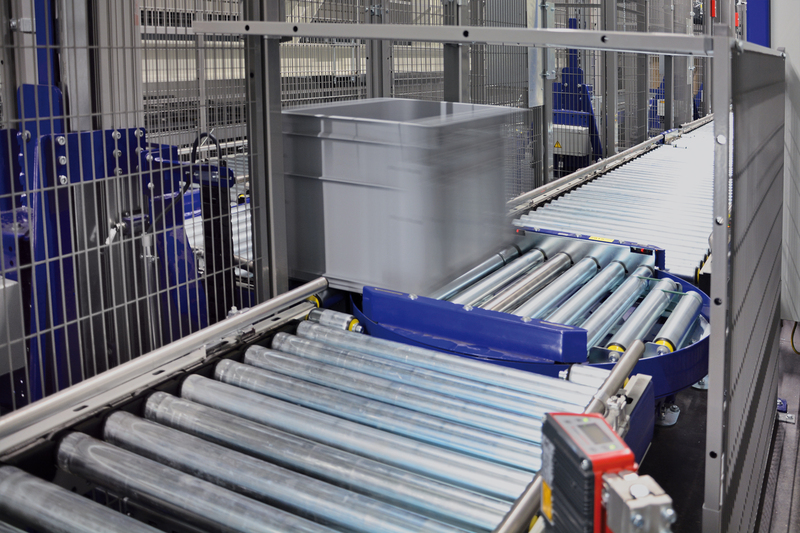 “Stöcklin thus worked out and installed a solution to fulfill all required functions while simultaneously providing a physical connection to the lower platform”, continued the Stöcklin Project Manager. The conveying system in the small parts warehouse picking area has a maximum system performance of 125 containers per hour. The loop at the picking levels on the second floor (8,500 mm) and third floor (12,550 mm) provides an hourly capacity of up to 400 containers. As a rule containers or items are transported through the system. Unbound articles not stored in boxes as well as bundles are transfered in containers. Here two versions with varying heights and a maximum weight of 60 kg in the loaded state are used. For reasons of safety and health, it is never permissible for employees to lift the containers manually. 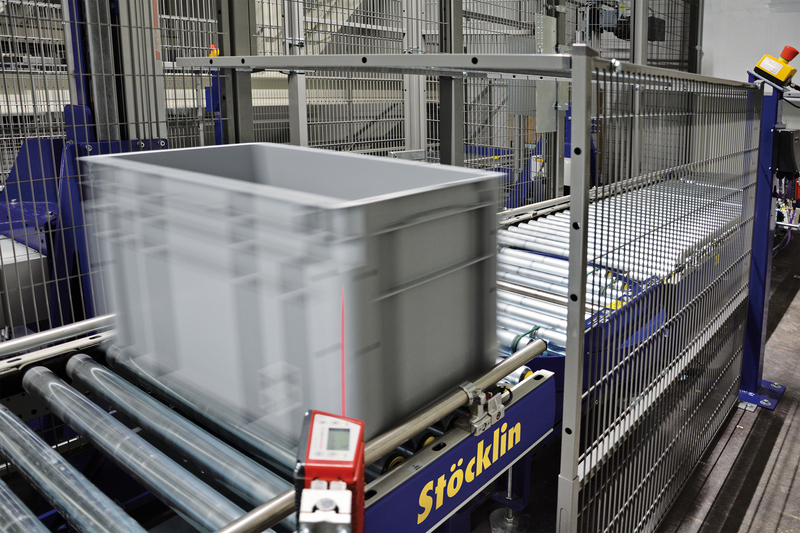 The retrieval positions transferred by the host to the StöcklinWMS are reserved when processing the order. This results in setup lists. When items are stored in small parts warehouse for the first time, Aleph also reports the required master data. The containers are taken over by the six BOXer E2D-H model stacker cranes at the check-in docks for the small parts warehouse. The abbreviation “H” stands for the German word for “piggyback” denoting a single mast unit for double depth longitudinal storage of containers using two load handling devices one above the other. The stacker cranes accelerate at a rate of 0.5 m/s2 to reach travelling speeds of up to 4.0 m/s, as required. The rates for hoisting are 1.0 m/s2 and 1.0 m/s respectively. Based on these values the stacker cranes provide storage and retrieval rates of 72 containers/hour each. To move the load carrier together with their sensitive cargo as gently as possible, the acceleration rates for the BOXer in the forward direction and for the load handling device were kept intentionally low. The oxygen concentration in the small parts warehouse was reduced from the normal level of 21% to only 13.5% for protection of the extremely valuable stock, to prevent fires from even beginning to ignite. Such an atmosphere, which is not particularly beneficial for humans, is present at the peak of the Eiger, for example. For this reason, picking is accomplished under normal conditions. The small parts warehouse is separated from the administrative tract by an elevator shaft with connected sluice. Orders to be delivered by courier or mail are processed according to StöcklinWMS specifications in consideration of the departure times and, after picking is concluded, put together as packages for transport. Transfer to the shipping zone is accomplished manually with the aid of hand pallet trucks. Customers ordering from home or in the libraries, can be assured their desired book or newspaper/magazine will be ready for pickup at the proper location at the latest within 24 hours after ordering. emphasized Business Manager Mike Märki. If institutions in other Cantons join the initiative, the book storage facilities can be expanded simply at any time. 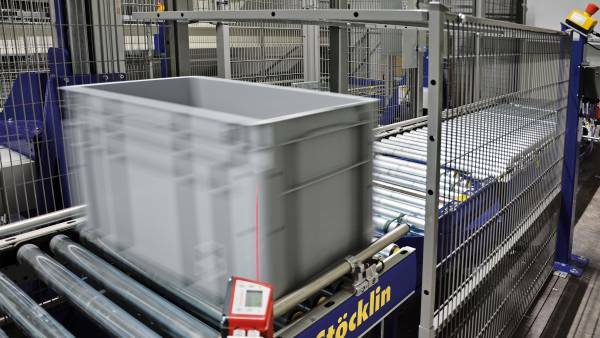 The scalable Stöcklin BOXer system with its modular design, has provided the prerequisites required for this purpose.